Delbert Belton. Chris Lane. An unnamed 13-year-old boy riding a school bus in Florida. What do these people have in common? They are all whites who have been violently assaulted by blacks recently. And on Mother’s Day of this year, 20 people were gunned down in New Orleans by Akein Scott, also black. All of his victims were black. Not white-blacks or white-Hispanic-blacks, but blacks. Alas for these departed souls, unless you attract the narcissistic attention of Barack Obama, you’re unlikely to get the maudlin media mourning mash-up that Trayvon Martin received as a reward for beating George Zimmerman’s face into the concrete. Without a cue from the Telepromtered One, the television shows do not reveal the racial motivations behind crimes committed by non-whites. The talk show hosts do not fight back stage tears when the music turns somber and reflective. When the snake charmer’s flute is silent, the cobras don’t rise out of the basket to strike. Everything is copacetic, and it’s almost as though the slaughter and thuggery in black America don’t even exist at all. Instead of a simple reporting of facts, what we get from the panjandrums at the New York Times and CNN are lectures on our desire to know the facts–scoldings for drawing natural conclusions from a preponderance of the evidence. This is not only one of many common themes of the media narrative–it is the defining characteristic of nearly the entire industry. After 9/11, for example, we were admonished *not* to be wary of Muslims. And it wasn’t just the news anchors who adopted a no-nonsense approach to eradicating the last vestiges of common sense. The morality parrots who write the prime-time police dramas also played along and invented a new genre: the Muslim seems guilty at first, but, plot twist!, it was actually the white guy. It’s *always* the white guy. Try changing the channel–you’re unlikely to find a different storyline unfolding anywhere. Except in the real world. 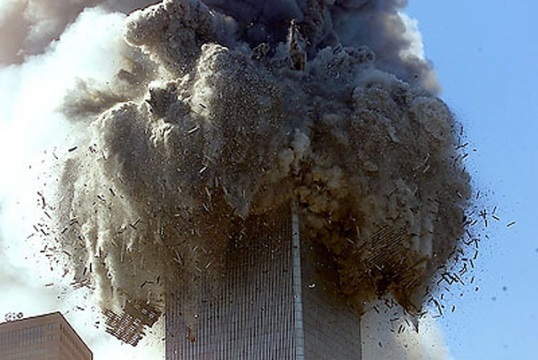 All nineteen hijackers who flew our airplanes into our buildings that crisp fall morning 12 years ago today were Muslims, for instance. As were the men who blew up our embassy in Kenya; blew up our barracks in Beirut; blew up the Taj Mahal hotel, Cama hospital, Chabad House, and other soft civilian targets in Mumbai; blew up the Marriott in Islamabad; blew up trains and buses in London; blew up trains and buses in Madrid; blew up the USS Cole; gunned down American servicemen in Germany; decapitated a British soldier in broad daylight outside the Royal Artillery Barracks in Woolwich; decapitated Daniel Pearl in craven darkness; fired rockets at kindergartens, hospitals, and nursing homes in Haifa, Israel; attempted to blow up one of our airplanes with shoe bombs; attempted to blow up one of our airplanes with underwear bombs; blew up the finish line crowd at the Boston Marathon; killed thirteen people at Ft. Hood while shouting “Allahu Akbar”; and killed 186 children and more than one hundred other civilians at a school in Beslan, Russia. The perpetrators, and their enthusiastic supporters, were Muslims. All of them. This is not what you’ll hear on the evening news, though. The media likes to pretend that it doesn’t deal in stereotypes, but willful misdirection–its stock in trade–actually contains all the pernicious elements of stereotypes, with none of the useful ones. For example, when James Holmes walked into a movie theater and started gunning down innocent people, or when Adam Lanza brutally murdered 26 people–including 20 children–at Sandy Hook, or when Jared Loughner committed similarly depraved acts of utterly meaningless violence against a defenseless congresswoman, it would have been refreshing to hear someone amongst the chattering class remark that these were all crimes committed by lonely, mentally disturbed young men. Of course, this is not what happened. We were told that guns were the problem. Inanimate objects were scapegoated, a poor substitute for facing the issue head-on. Amidst the cynical policy discussions piggybacking on personal tragedies, we were told that guns, and not disturbed young men, were to blame. Stereotyping is alive and well, but it has been adjusted to fit your TV screen. In this way, the news-and-entertainment industry reverses the obvious and presents us with the surreal, the world in which Muslims are *never* guilty of blowing things up, blacks are *never* guilty of murdering white people just for the sake of their being white, and deranged loners are not the problem, but rather the cold, unfeeling steel equipment that they use in carrying out their horrendous crimes. We thus see the truth half-formed, as through a glass darkly. The greatest transgression, we seem to hear, is not actually maiming and murdering people, but believing that someone could be capable of such an act. It is suspicion and judgment, not Muslims with pipe bombs, outcasts with crazed grins, and blacks with violently racist Twitter accounts, that we are to condemn. What our common sense tells us, though, is that patterns emerge out of repeated behavior. Nancy Grace-ish grandstanding and moral posturing notwithstanding, we know instinctively that a woman in a burqa at an airport could be trouble. Maybe she is just somebody’s mom. Maybe she’s at the airport because she’s bringing apple pie recipes to her family in Yemen. But, if a terrorist is going to be anyone, he is probably going to be a Muslim. And a Muslim may try and wear a burqa in order to conceal his murderous designs. Even actual women in burqas have committed heinous acts of mass murder. It is not offensive to say that, based on prior events, there is a higher likelihood of a terrorist being a Muslim than not. Indeed, it is the plain truth. When I am on an airplane and I see someone who appears Middle Eastern–a broad brush with which to paint people, I know, and yet I would rather be proven wrong than wish I had not been right–I take note. I look around the cabin to see whether he might be traveling with other people. I look for strong men with whom I might team up in case something untoward were to transpire. I look for children who might be in harm’s way. And then, I sit back and enjoy the flight. If something were to happen, God willing I would be ready. It would be a dereliction of my moral duty to see a plane full of innocent people, notice a potential threat, and yet pretend that nothing was amiss. I stereotype. And I do it constantly. Until I know a person as an individual, I see him as part of a group. It is the responsible thing to do. While stereotyping is patently anathema in our current Edvard Munch dispensation of farcically exaggerated expressions of shock at the depravities of the human heart, I submit here that “stereotyping”–among the most infrequently examined words in our language–is undeserving of its classification between “snobbishness” and “bigotry.” Most often overlooked are two key nuances embedded in the term. First, stereotyping is an extraordinarily useful practice. It allows us to peruse our world in shorthand without getting overwhelmed by details. By bundling fleeting impressions and mapping them onto previously understood facts, we move with greater efficiency through a myriad of sensual stimuli and brief social interactions. Second, stereotypes aren’t–or shouldn’t be–final judgments about individual people. I am delighted when my stereotypes are proven wrong by those with whom I am able to interact in greater intimacy. Stereotypes, in a very real way, are made to be broken. They are merely placeholders, ways of indexing strangers, but they are not fixed, and actually do not work at all when they are. Just as the original meaning of “stereotype” was a dual picture viewed through a special spacing device that produced a three-dimensional image of a scene, stereotypes are merely abstractions of the infinitely complex world. Stereotypes do not replace detailed judgment, they merely help suspend it until it is necessary to engage with someone on a deeper level than a chance passing calls for. Many will likely wonder what a white man knows about stereotyping and prejudice. Perhaps more than one might think. For about eight years I lived in East Asia, by my own choice and because I am fascinated by the region as a whole. There were many moments of cultural vertigo, and more than a few times when I was disappointed in my expectations. Above all, there was a pervasive prejudice that was simply an ineluctable part of nearly every daily interaction: people tended to assume that I could not use chopsticks, for example, or that I could not communicate in anything but a European language, or that my manners would be an embarrassment in more delicate social settings. Strangely enough, even though I had been a particularly obnoxious leftist as an undergraduate, with all the accoutrements of self-righteous racism-denouncing that you might expect, in East Asia I began to see how useful, and often accurate, stereotypes really were. For example, I could not help but notice that many of the other foreigners I knew in Japan or China or South Korea were busy making the rest of us look bad. I could understand why local people would be wary about befriending someone who was associated, whether willingly or not, with a group that was sometimes so deserving of its reputation for boorishness. Unfailingly, once I got to know local people on a personal level, those prejudices gradually disappeared, and we were freer to like or dislike one another based upon our individual traits. (Strangely enough, it is almost impossible to stereotype people once you have lived among them as an outsider. Stereotyping is a privilege of majorities.) Likewise, I, too, had to learn to suspend my snap judgments of other white people in Asia–not *everyone* was a potential Judy Tenuta or Andrew Dice Clay. But, as a faute de mieux index of probable behavior, I saw with rather discomfiting clarity that stereotypes were extraordinarily useful things. They were often more or less correct. And, contrary to what we have heard ad nauseam in the media and in the academy, stereotypes are rarely forever. They accommodate, they dilate to admit new information, but they also snap back to conform to the shape of the general reality in which we all must live. They are working models in malleable clay, not bronzed statues or works etched in stone. But could this uneasiness around blacks not also be due to a perfectly healthy and normal stereotyping, a product of statistics like the following? a/ Blacks outnumber whites in prison, despite accounting for only about thirteen percent of the general population. c/ Although black-on-black violent crime is vastly more prevalent than black-on-white violent crime, black-instigated “hate crimes” still accounted for eighteen percent of the total number of hate crimes in 2010, while white-instigated hate crimes were 58% of the total. This means that, compared with the total population, blacks are actually *more* likely to commit hate crimes than are whites. It would seem, in light of these and similar figures, that stereotyping, while perhaps not a pleasant practice to admit to, is at least grounded in reality. Or would it be better if we pretended that such statistics didn’t exist? To put it another way, how many black men must commit violent, even racially motivated, crimes before we finally turn to black men and say, “Please stop doing this?” Lacking this honesty, which would be the first step toward solving the problem, people follow the next-best rational course, which is to hold their purses and lock their car doors whenever blacks are passing by. And, no, not blacks in business suits or blacks taking their families out for ice cream. Let us be frank with one another and say that we mean a certain kind of black person: young, male, like the ones we see in mug shots on local (but almost never on national) news: blacks with a murderous emptiness behind their eyes, blacks with a smoldering hatred in their hearts, blacks with a score to settle with the world, and especially with the white people in it. Stereotyping does not necessarily draw all people together into a racial category–it is limber, dissecting and grouping according to prominent characteristics. It is not up to me to solve the problems in black communities. It is up to blacks in those communities. Pretending like nothing is wrong will only delay the reckoning with reality that must surely come. It is incumbent upon us to interact with one another in charity. This means giving people the benefit of the doubt, and insisting on the irreplaceable dignity of each human being. But until the time for that more intimate personal interaction comes, I will make up my mind about strangers based upon the only information available to me: how they look, and how they act. I will make my own tentative judgments, and I will be more wary of some than of others. With malice towards none, but with a full realization of the existence of evil in the world, I will stereotype, until I have reason not to. Fix contributor Jason Morgan earned his bachelor’s degree at the University of Tennessee at Chattanooga, his master’s degree at the University of Hawai’i, and is currently earning his doctorate at the University of Wisconsin, Madison.